.At Bethel, guests and members alike find warmth and acceptance, inspiration, encouragement and friendships that will last longer than a lifetime. Discover your gifts. Fulfill your purpose. Impact your world. How do I find my gifts? Most people never find their purpose and calling in life, because they wait to serve until they see an area they feel called to for a lifetime. Most of the time, however, we don’t discover our true calling until after we’ve begun serving where we see a need and an opportunity to impact others right where we are! 1) What do I love doing today? 2) What am I good at today? 3) Where can I use this passion and talent today? One, two, or perhaps all three of these answers will help you begin to identify where God wants you to start. 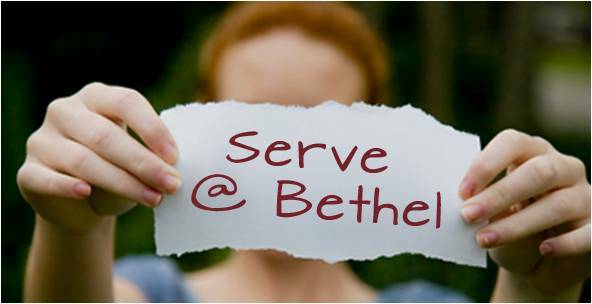 We’d love for Bethel to be the place for you to get started. We’ve focused our serving opportunities into eight ministry areas, each utilizing a unique set of gifts and interests. We invite you to take a look and compare your interests with some of the opportunities listed below that may match your talents/interests. I have practical skills to help the church operate efficiently and effectively. I'm interested in providing emotional and spiritual support to those in need. I have interest in helping people enjoy a warm & comfortable experience from their church. I have artistic and technical skills and passion to touch & transform lives. I'm interested in helping people in our community find a personal relationship with Christ. I'm interested in helping young people and young adults learn about Jesus and address age appropriate issues. I'm Interested in helping children come to know Jesus in a real and personal way. I'm Interested helping people grow in their relationship with Christ.